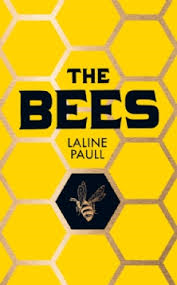 The Bees is the debut novel by playwright Laline Paull. It is set in a beehive and, quite naturally, features a bee as its protagonist. It is a bold and detailed feat of imagination, completely different from anything I’ve read before. So much so that, at halfway through, I can’t tell you even if I like it or not, only that I am marvelling at the literary braggadocio of setting a novel in such an alien environment. Flora 717 is a mere sanitation worker, hatched in the hive to a life of servility in the lowliest echelon of her society. However an enigmatic “Sister Sage” marks her out after finding she can “talk”, a trait unusual in her kind. Flora’s bravery, devotion and diligence see her being allowed into areas and walks of life normally closed to her kin; even being granted an audience with the Queen after she taps in to the hive mind to defeat a wasp. It is a thriller about an individual in a totalitarian state, exploring thoughts on everything from pollution to tribal rites and urges along the way. Everything is as richly detailed and assured as honeycomb itself: from how the bees communicate to all the different kins of sisters to the honking, hilarious drones. The cover is also very cool. Recommended.